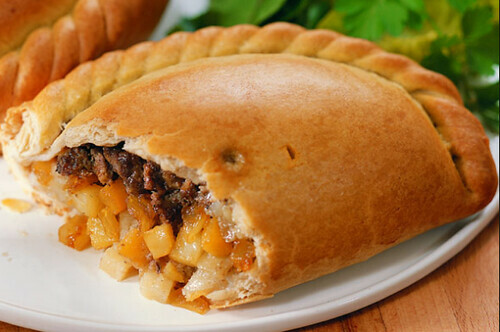 Cornish pasties are a British delight loved in the isles and Ireland and make a good boxed lunch or a main course. To make the pastry it needs 4 oz all purpose flour, salt, 2oz butter, cubed, and 2-3 tbsp cold water. Ingredients for the filling are ¼ cup onion, finely chopped, 1/2 cup potato, cut into 1/4 inches, ½ cup swede cut into 1/4 inch dice, 4oz rump steak, cut into small cubes, salt and pepper, and 1 egg, lightly beaten. Pre-heat oven to 425 °F and make the shortcrust pastry. First add flour, butter, and salt in a bowl. Rub the butter into the flour with fingers until the mixture resembles fine breadcrumbs. Add water and use a cold knife to stir until the dough binds together. Add more cold water if the mixture is too dry. Wrap the dough in Clingfilm and chill for a minimum of 15 minutes. Divide the pastry into 4 and roll each piece into rounds of 6-7 inches. Add onion, potato, swede, and meat in a bowl. Season well with salt and pepper, then divide between each pastry circle and place to one side of the circle. Brush the edges with a beaten egg and fold dough in half over filling so the edges meet. Crimp together to create a tight seal and brush with the remaining egg. Place on a greased baking sheet and bake for 45 minutes until golden brown.